* # of Episodes ! Breaking News! Just added to this collection; Screen Test Auditions for the rolls of Andy and the Kingfish ! In 1950, Spencer Williams auditioned for the roll of his life; Andy Brown. You can also see the screen test for the guy that didn't get the job. 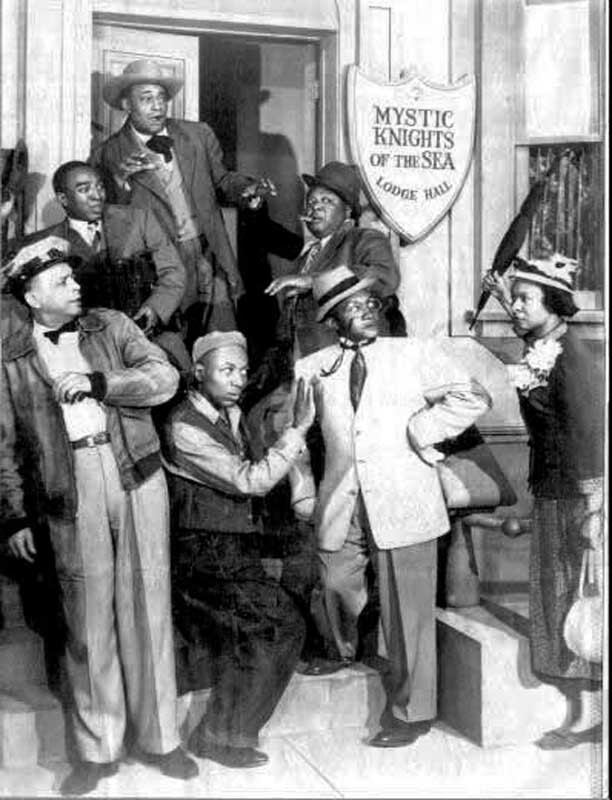 There are even white guys wearing blackface auditioning for the rolls of the "Kingfish" and "Andy Brown"! The Truth about "Digitally Restored" vs "Unrestored"
Most of what you see online is intentional blurring, not restoration! The comparisons are not real. It is easy to blur something that is already clear but difficult, time consuming and expensive to improve a low quality print. Below is "Jewelry Store Robbery" which was one of the lowest quality episodes we have restored. We preformed digital restorations in 2001 and again in 2015 using the latest technology. Tricky advertising is funny when the "Kingfish" does it but not so funny when you are the victim of deception. Take your time, do your homework, know what you are buying! What is Amos and Andy? Amos and Andy is one of the funniest and most beloved television and radio shows of all time. Alvin Childress (Amos), Tim Moore (Kingfish) and Spencer Williams Jr. (Andy) were three of the finest comics of all time. Who can forget hearing "Holy Mackerel Andy!," and " I'se regusted, Andy!" The raw talent and humor that they exuded touched us all, and they will always be fondly remembered. Perhaps someday the networks will end their blacklisting of this popular radio and TV show. The truth is, Amos 'N Andy was no more demeaning to African Americans than The Beverly Hillbillies was demeaning to southern whites. We have "Amos n Andy" TV Episodes found nowhere else. We have a lot of Amos n Andy history articles, photos, facts, trivia and sounds here. Check out our Amos n Andy Forum to ask questions or talk to other fans. The Complete Collection Is Here! We have More "Amos n Andy" TV Episodes! The Most Full 30 Minute Shows! incomparable picture and sound quality for greater enjoyment! This is the absolute Most Complete set available! We have the lost TV episodes available nowhere else. Sellers have become very creative in the way they count episodes and even what is, or is not a lost episode. 1. There were a total of 78 episodes made. 2. As of today, Dec 1, 2014 there are still 4 missing episodes. 3. In Dec. 2014, two actual, really "Lost Episodes" were added to this set. 4. No One else has these episodes. 5. You can buy them separately or get them free with this set. 4. The "Cast Introduction" is not an episode. 5. "Lodge Brothers Complain" and "Andy Gets Married" have been out for years and should not be advertised as lost episodes. 6. "Check and Double Check" is not an episode. Do your homework and know what you are buying. If you feel you were misled, send them back. The internet is full of wild claims. The original order has been so widely misrepresented online that it has become the accepted fact; but is totally wrong! * 21 Professional Quality Disc In All !